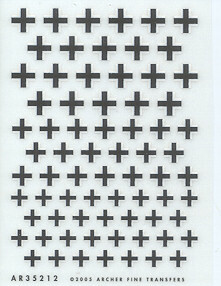 This set consists of various German insignia in two sizes for 1/35 vehicles. These are designed for those vehicles that have zimmerit coatings, so are slightly different than standard insignia. Though difficult to see, there is a white section to each of the markings on the sheet. These are dry transfers so there is no carrier film to worry about in terms of silvering. If you wish, you can place these on clear decal sheet and use them as ordinary water-slide decals.